Identify your team and brand at trade shows and company events with personalized identification holders from Promotion Pros. 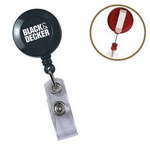 We offer a variety of identification holders, from vylon badge holders and clip-on Secure-A-Badge to round Secure-A-Badge holders. With all of our options to help ID staff at company events and trade shows, you're sure to find what you need. 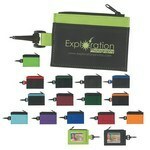 Custom holders allow visitors to your booth or table at business expos easily identify your company and team members. 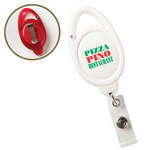 Our promotional ID holders are a must-have for any company participating in a trade show. Name Badge holder 2-3/4" x 3-3/4"
This handy and high quality Name Badge Holder is made of clear vinyl for professional look and feel. 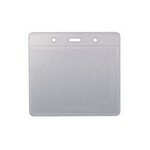 You can easily insert your name card in this 2-3/4" x 3-3/4" holder and use it as per your business requirements. 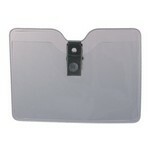 This high quality Name Badge Holder is made of clear vinyl for professional look and feel. 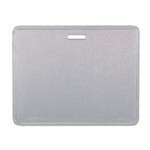 You can easily insert your name card in this 3” x 3-7/8” holder and use it as per your business requirements. 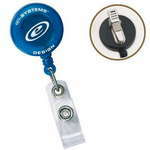 Our custom clip-on secure-a-badge clip features a durable grip design and a single logo imprint. Our custom badge clip features a durable grip design and a single logo imprint. Our custom alligator badge clip features a durable grip design and a single logo imprint. Name Badge Holder w/Lanyard: 4-5/8" x 4-1/2"
Get this trendy Name Badge Holder and create your own inserts for a smart professional look! 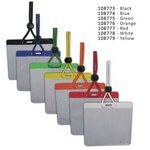 This name badge holder features eye catching multi-color lanyard attachments for that attractive look. Made of high quality vinyl, this name badge holder is ideal for trade shows, identity tags, and display of security passes and could be used for all conferences, conventions and assemblies where you need to present your brand identity in its full glory.